TV show is introducing cutting-edge technologies to keep its young fans engaged. These are some of the advanced technologies being showcased nationwide in the second season of a popular variety show on science and technology - My Future. It airs on Hunan Television, known for its entertainment shows, battling with talent shows and reality shows designed for young viewers. The show, which is produced with help from the communication bureau of the Chinese Academy of Sciences, presents three products each week. 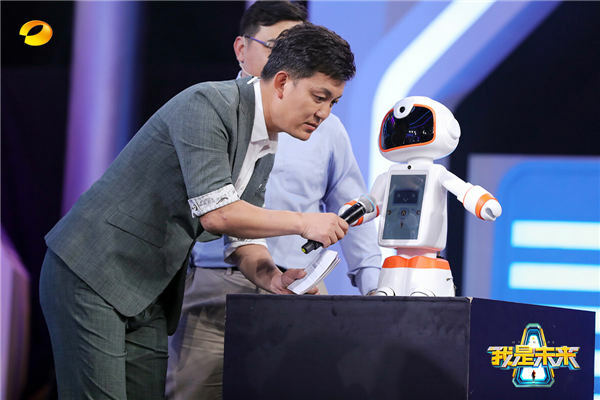 Speaking about the show, its producer Yang Hui says: "Science and technology change our lives and shape our futures, but there are very few variety shows about science and technology." Yang, also the CEO of Visionary Media, worked for a year to produce the first season of the show - showcasing cutting-edge high-tech from around the world. In the show, scientists are in the spotlight, introducing their inventions and inviting the audience to test them. "We want our show to serve as a means of education for popular science, let the general public peek into the scientists' circles, and inspire young people to choose scientists as their role model and 'superstar'," she says. In the first season, the show featured the chief scientists of big IT companies such as IBM, Microsoft and Intel. Most of the technologies being featured in the current season are "made in China", and they are relevant to daily life, such as the companion robot and augmented reality navigation. The ongoing season of the science TV show focuses on young people more than before. And in order to attract more young viewers, it has young idols as guest hosts, including Wang Bowen, Xiong Ziqi and Liu Chenglin, who have millions of fans among China's post-millennials. A young talk show performer Chi Zi is also part of the program. The audience rating for the show topped all the programs aired in the same time slot on Thursday evenings among viewers aged between 4 and 23, according to Yang. Speaking about loyal fans, Yang says: "I am so happy to learn that one little boy was so fond of our show that he watched every episode of our first season and bought our popular science book. "So we invited him to participate in the filming for our second season." At an entertainment industry forum held by European Broadcast Union in Berlin in September, the Chinese popular science TV show, My Future, was introduced to more than 100 European TV professionals as one of the creative programs from China, combining popular science with variety show.